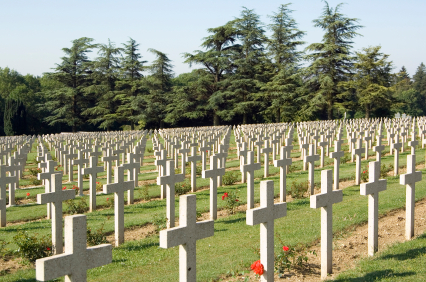 The WWI cemetery at Verdun. Newspapers here in Britain are full of articles about 1940 and the various 70th anniversaries that fall this year. But what almost no one seems to emphasise is how the Second World War – including the key events of 1940 – existed in the shadow of the First World War. The anxieties of the German General Staff, for instance, just before the invasion of France in 1940 were largely the result of fear of a repeat of the trench warfare in Flanders. Indeed, one of the most important insights I gained from meeting many former Nazis over the last twenty years is that it’s almost impossible to over-exaggerate the importance the First World War played in shaping the Second. Not just in the obvious way – the defeat of Germany and the perceived injustice of the Treaty of Versailles – but in an emotional, visceral way. Many of the Germans who fought in the First World War were so affected by their personal experience in the trenches that it changed their lives forever. That was certainly the case with Corporal Adolf Hitler. Indeed, I don’t know one serious historian who thinks that Hitler could ever have gone on to become Chancellor of Germany if it hadn’t been for his experiences in WWI. And it’s not just that he wouldn’t have become ‘famous’ without WWI, it’s that he wouldn’t have personally developed into the Hitler who became a ‘conviction’ politician without his experience at the front. I think many people tend to forget that their outlook – perhaps even their fundamental character – is often shaped by the circumstances that come their way (what ‘happened to happen’ as Philip Larkin put it). And the First World War was a key factor in shaping the beliefs of millions of Germans. It was the memory, for example, of the ‘shame’ of the surrender in November in 1918 – with the German army giving up whilst still fighting in France – that meant that many Nazis were not prepared to capitulate until the Red Army reached the centre of Berlin in the spring of 1945. More than that, it was the effect of seeing so much death and destruction in WWI that hardened many German hearts and helped create the horrors of WW2. The perceived legacy of WWI even played an important part in the origins of the Holocaust. I remember, for example, a former member of the SS who worked at Auschwitz saying to me that one reason he felt the Nazis wanted to kill the Jews during the Second World War was to ‘prevent’ what had happened in the First World War happening once again. He believed in the Nazi fantasy that the Jews had somehow orchestrated Germany’s defeat in 1918 and so he thought it was understandable that the Nazi leadership should now demand the extermination of Jews. It was a point of view made all the more loathsome by the reality – which he denied – that German Jews had actually died in disproportionately high numbers during WWI in an attempt to defend their Fatherland. One of the great challenges of history is to try and trace a pattern in the past. What were the great turning points? What really affected the course of events? And in that context, in the story of the Twentieth Century, I believe it is the First World War which transcends everything else. Europe’s first ‘modern’ war – where the modernity took the form of high explosive shells which could eviscerate your comrades so that nothing was left of them but a few tattered pieces of cloth. Just imagine what it must have been like to experience all that. Surely you could not have emerged from that war as the same person you went in. Then think, if you had lost that brutal struggle, about how you would want to avenge that defeat. And the methods you would be prepared to use to gain victory at last.